On October 30, the Catholic Church honors a man whose humble occupation gave the world only glimpses of his extraordinary holiness. During his lifetime, Brother Alonso Rodriguez never became a priest, published a book, or advanced professionally. But writings discovered after his death revealed a true mystic, who attended to a rich spiritual life while he worked as a doorkeeper and porter. Born in Spain during 1532, Alonso married at 26 and worked as a cloth merchant, coming to religious life only through a string of crushing tragedies. His wife and two of their children died by the time he was 31, and his turn toward a life of prayer and penance could not prevent the subsequent death of his third and last remaining child -- nor the discouraging failure of his business. Without his wife and children, and having few prospects due to his lack of a higher education, the Spanish layman turned his thoughts to religious life. Even there, however, he faced difficulties. In his early years, Alonso had met one of the first Jesuits, Bl. Peter Faber, and with his old life in ruins, he developed an interest in joining the recently established Society of Jesus. Alonso's lack of education prevented him from pursuing their course of priestly ordination, and he failed to acquire a diploma from the College of Barcelona despite attending for two years. The Jesuit Fathers in Valencia said he was unfit to join. But Alonso's years of prayer had not been in vain: they were answered when a provincial of the society, sensing his dedication, admitted him as a lay-brother. In modern times, Jesuit Brothers work in a wide range of fields, with few limitations apart from their lack of priestly ordination. During the 16th and 17th centuries, however, the lay-brothers of the Society of Jesus were known as “temporal coadjutors,” and assisted the priests of the order by performing its more routine duties such as cooking, construction and farming. The Jesuits sent Rodriguez to the college of Montesión on the island of Majorca, to work as a porter and door-keeper. 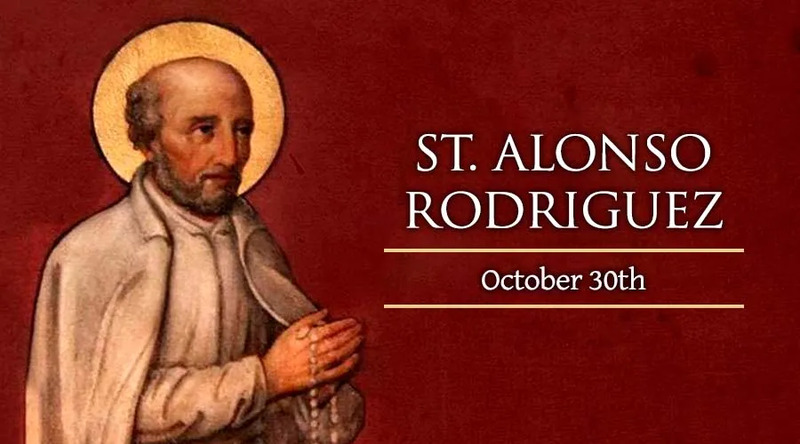 He assumed the responsibilities of receiving visitors and guests and carrying their luggage, tracking down students or priests when they were needed, delivering messages, and distributing alms to the poor. While other Jesuits traveled the globe evangelizing whole nations, and undertook a vast reform of the Catholic Church throughout Europe, Alonso carried bags and ran errands for 46 years. But students began to seek him out, realizing that their doorkeeper was a man of unusual wisdom and faith. His Jesuit superiors started to take notice as well, and asked him to begin a private record of his life and thoughts. Rodriguez struck up a notable friendship with one young man, Peter Claver, and advised him to volunteer for the South American missions. Following his advice, St. Peter Claver eventually catechized, baptized and spoke out for the rights of 300,000 slaves in South America. When Brother Alonso died in 1617, his superiors examined the written records he had left behind describing his spiritual life. What they found was the life of a saint and mystic. His approach was simple: Christ was appearing in every person who appeared at the door; the task was to encounter God in any task. From this awareness, he proceeded to a life of contemplation akin to the renowned saints of his era (such as St. Ignatius or St. Teresa of Avila), whose grand achievements are better known. Brother Alonso Rodriguez was declared a saint in 1887. He is buried on the same island of Majorca where he answered the door and carried bags for five decades.